Sun Shade hand fans shade your eyes while watching outdoor events like air, boat and car shows. Fans are made of 22 pt. high density white paper board and UV coated with high gloss finish on front & uncoated on back. This fan can be printed on both sides, but design art to allow for a glued 8” wooden handle and film eye cut outs on backside of fan. 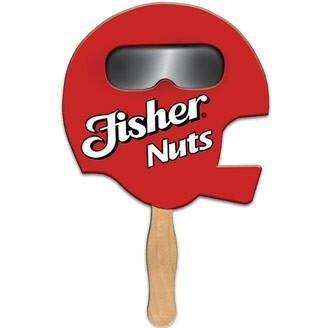 Fans are mini billboards & perfect for branding a custom message. Great for sports, games, trade shows, fundraisers, churches, businesses, political & corporate events. Several shapes to choose from or call to create a custom shape. Plastic handles available for additional charge. Scratch Off Dot $.16 (T) Call for quote. Size : Approximately 8" x 8"